Exploitation of resources, global warming, and mounting inequality - economic and ecological crises are leading to an impasse. Our development model, which is based on profit, competition, and never-ending material growth, has pushed our planet to the limit. These crises cause many people to feel discouraged and powerless. The roots of these systemic upheavals are cultural and spiritual. They come from a way of thinking and living that separates man from nature, and reduces nature to a commodity. The challenge is to find a way out of this destructive pattern, and become a society that is respectful of life, and based on principled relations between man and nature. our view of other people and living things, as well as their dignity and our relationship to them. This transition can be seen in numerous initiatives being created all over the world. The film Tomorrow depicts this using the concrete examples of permaculture, education, renewable energies, alternative currencies, and economies striving for social solidarity. Working in the North and the South, Bread for all supports new models of food production and economies based on cooperation between people and respect for natural resources. Bread for all works towards this goal on various levels: internal and external, individual and collective. Politically, we advocate for reforms in structural and legal frameworks. Spiritually, we encourage the search for meaning and sacredness in order to foster values such as charity, diversity, and contentment. We provide the tools that expose people to opportunities and offer hope, helping them move from apathy and despondency to a new form of engagement. Bread for all helps create synergies between people working towards change in the North and South and brings them together in mutual support of the transition to new models. At the same time, our organisation is able to change our structures and how we function in order to adapt to these new models. 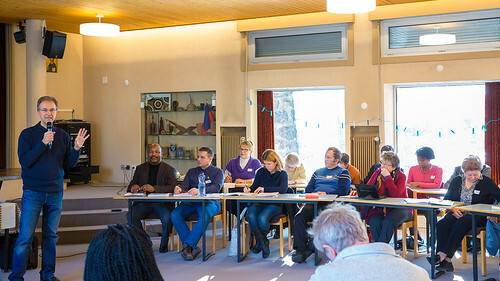 Bread for all has created a place in the western part of Switzerland to explore and better understand inner transition. Headed by sociologist and ecological theologian Michel Maxime Egger, it focuses on eco-spirituality.